Under the WordPress Appearance options menu are links to edit your site’s background and header, manage site navigation with menus and add widgets to the sidebar or other widget areas. The tutorials for this section are listed below with a link to each.You can access any tutorial, in any section, at any time by expanding the main menu in the sidebar to the left or by using the Sitemap. Learn how you can change WordPress themes with the click of a button and alter the appearance of your site without disturbing the content. Using Custom Fonts and Link Colors for David Themes New to David Themes at version 2.0 is the ability to change the Header and the Entry Title Fonts for pages and posts. As well you can now change the color of your links. Depending on your theme and how your site was set up, not all these items may be available to you. For instance, if Artbiz created a custom website with custom graphics for you then there would be no need to change the theme, background or header and these menu items will not appear. However if you have one of Artbiz’s Artist Themes then you will be able to alter the background and header depending on the theme. If you have an Artbiz a WordPress + + Subscription then the theme option will also be available. I added my social media links which appear as black and white small icons at the very bottom of the pages (below the copyright text). when i click on them, it opens to that page but not as a new window. is it possible to open as a new window rather than be taken away from my site? And then what about the full color, larger group of social media icons on all pages except my blog? they open up a new window to those sites as a potential post. The color ones are visually overpowering the littler black and white ones. Am i missing some advantage? I should delete the color ones. but where? 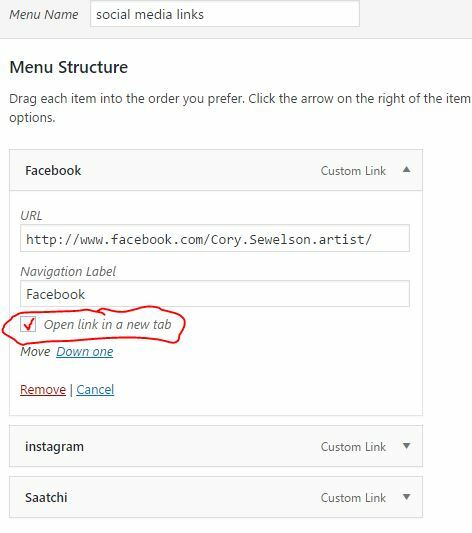 Cory, go to Appearance > Menus and open the menu item and look for “Open in new tab” and check the box beside it. The social media menu is for you to link to your own social media sites. The colored ones are for people to share your work on their social media sites. We want people to share your work and get you exposure. I go to the Appearance>Menus. I don’t see anything labeled “menu item” to open. I don’t see “Open in new tab” with a box either. Another clue please. I don’t mean something literally named “Menu Item”. A menu item is an item in your menu. Sorry for the confusion. Review the menu tutorial so you know where everything is. And here’s a screenshot of where the “Open in new tab” is. that box – “open in new tab” is just not showing on my screen. Everything else in the screen grab is visible on my screen. What could be causing that? Look to the upper right corner of the screen when in the menu admin area and click on Screen Options. Make sure the boxes are check to show the items you want. I looked at the Menus tutorial again and saw the “open in new window” box in the tutorial. it’s in each menu heading’s pull down options. It’s just that it doesn’t appear in my pull down options on my menu headings. Then the next thing I see is “move” . That is on both the tutorial and my website. Before I tackle the Gallery I have to work on resizing the images I have. I think I should do that before I continue. But I am having spam issues, through the site with the “new user” and also my emails as comments, and quite a few of them. The emails go through the host and somehow get forwarded to my emails, none of which is the one associated with my site account. Now, I can’t find info in your tutorials about spam controls, plugins, email. There is a plugin called Akismet already listed, do I use that? People suggest Jetpack, and others say stay away. I’ve been playing with this computer stuff all day, and at this rate I’ll never paint today. Let me know if this is too much trouble for you to address here. Maybe you could point me in the right direction. Yes Dora always use Akismet, activate it under the plugins and configure it. I set up all my sites with Akismet and a contact form. If you publish your email it’s just a matter of time before the spam starts. Also in your hosting cPanel make sure Spam Assassin is also activated for your email. That should stop some of the spam from getting to your desktop. You can also search the plugins at wordpress.org for a captcha plugin for your comment form. Thank you. I did everything you suggested, and the contact form I used had a captcha attached already. I’m sure I’ll have more questions as I go along. Your tutorials, and you yourself, are a life saver. Hope it works out Dora. I’m happy to help. It does add all the styles to the head of your site though, making the load time a bit longer. If you would like to selected a http://www.google.com/webfonts it can be installed into the header.php and the styles added to site-title selector in the styles.css. I’m not sure of your comfort level with code so if you want me to do it for you I have a $25 min fee and I’ll need your login credentials. Nice to see you back, I was wondering if you were moving forward with your WP site.